Shari Rolston, center, owner of South Street Wine Cellar, pours some wine for a customer at the shop’s grand opening Saturday. 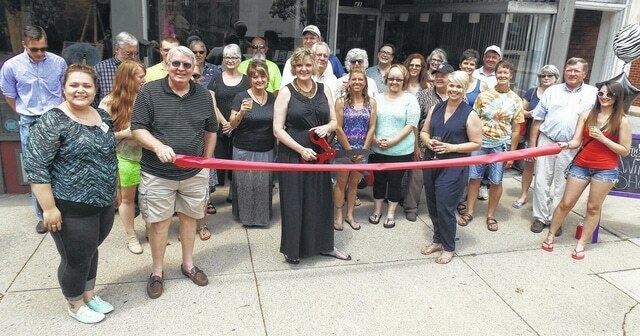 The grand opening of South Street Wine Cellar gathered a crowd Saturday afternoon for a celebratory ribbon cutting. WILMINGTON – South Street Wine Cellar is open for business. Wilmington’s newest wine shop, located at 41 N. South St. in downtown Wilmington, celebrated its grand opening Saturday with more than 100 people coming and going throughout the day. Shari Rolston, the shop’s owner, told the News Journal she’s very pleased with her flow of business so far. Rolston said the business has surpassed its goal for its first month of business. She said she’s had several people from out of town come in, including a couple from Oregon. “I have a lot of great interactions like that,” she said. South Street Wine Cellar currently offers about 80 different types of wine, Rolston said, saying she’s constantly gathering new inventory. “I try to introduce something new to the shop every week when I place my new orders,” she said. Rolston currently has two Ohio wines in stock, but hopes to gather more in the future. Rolston said she feels very welcome in Wilmington. South Street Wine Cellar is open Tuesday through Saturday from noon to 7 p.m.
Wine tastings will be held on the second and fourth Friday of every month from 4:30 p.m. to 7 or 7:30 p.m. for a small fee. In addition, the wine shop offers a “Wine-One-One” class on the third Tuesday of every month. Those interested can register online by visiting southstreetwinecellar.com. Reach David Wright at 937-556-5770, or on Twitter @DavidWrighter.